Sabbioneta is located on the left bank of the Po river. In the 16th century, an important center of culture thanks to the effort of Vespasiano Gonzaga. 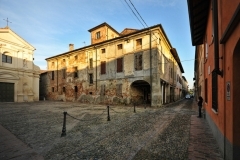 In 1427, Sabbioneta was annexed to Mantua by the Marquis Gianfrancesco Gonzaga, and, in 1444, was assigned it to his son Carlo. Vespasiano Gonzaga died without a male offspring and Sabbioneta underwent a rapid decline, becoming the possession of various lords, until, in 1746, it was annexed to Austria, along with the former duchy of Mantua. The first trace concerning the presence of Jews in Sabbioneta dates to 1436, when Gianfrancesco Gonzaga granted the brothers Bonaiuto (Azariah) and Bonaventura (Meshullam) Dattilo (Yoab) da Pisa permission to open up a bank. Due to the loss of Bozzolo’s and Sabbioneta’s ducal archives, no testimonies remain of the early Jewish presence in the city. 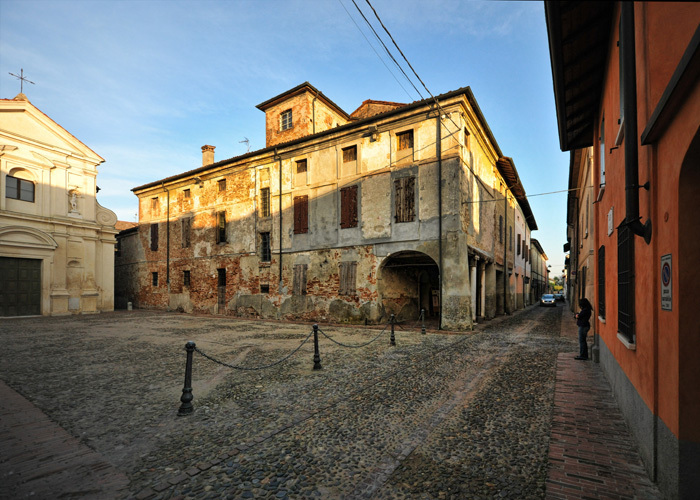 During the 16th century, Sabbioneta welcomed a growing number of Jews: Tobias Lazarus (Tuvyah Eliezer) Foa, a wealthy and well-connected Jew, originally from Savigliano, arrived in the Sabbioneta in 1551 and opened the first printing press under the auspices of Vespasiano Gonzaga. 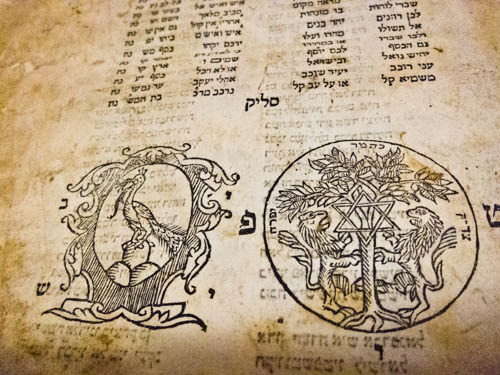 The city soon became an important center of Hebrew printing. The Foas invited several experts in the art of printing to come to the area to work , including Jacob Neftaly Coen from Gazzuolo, Yosef of Yaakov Shalit, a German man from Padua, the Cornelius (of Israel Barukh) Adelkind and Israel Daniel Zifroni from Guastalla (who lived in Gazzuolo). After Adelkind’s conversion, the sons of Foa (Eliezer and Mordechai) took his place. From the printing S. came dozens of texts, between 1551 and 1590, and we know that in 1567 Christian Vincent Conti, particularly known for his work in the Hebrew print shop in Cremona, printed here. In the early 17th century (1606), Paul V gave a banking license to the brothers Solomon, Jacob, Isaac and Abraham di Benedetto Forti ( “De Fortis”, Hazak), and renewed it in 1610, 1618 and 1619. In 1640, Urbano VIII extended by thirty years the license in favor of Ventura, Isaac and Abraham Forti. In 1729, the Jews of Sabbioneta and Bozzolo were able to renew their privileges. Only a few years later however, in 1744, the Inquisitor forbade the ritual slaughter of animals. In 1780, a privilege was granted, on behalf of the Empress Maria Theresa, to the Jews of Sabbioneta and Bozzolo; it was thus ruled that Jews had the right to turn to the rabbinical courts for internal civil cases, the right not to pay court fees higher than those paid by the Christians, the right not to be sued on Jewish holidays, the obligation to lease to the Christians real property acquired as a result of judicial enforcement, the right to rent warehouses under court license and the right to practice lending, at an interest rate not exceeding 6% per year. Records of the brotherhood Temime’ darekh (“the followers of the right path”) dating back to 1760, indicate that the organization was intended to oversee all financial activities related to religious activities, including auctioning the rights to perform certain ceremonial acts and the administration of charity. The treasurer was acting under the direction of two Massari (Memunim), chosen by lot from year to year. In the 16th century, while banking and printing were flourishing among the Jews of Sabbioneta, many families were also active in other trades, including grains, livestock, wine and silk. They also built a textile mill and a leather tannery in Ponteterra. 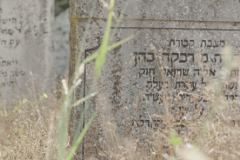 In 1773, records show that there 63 Jews lived in Sabbioneta. In the early 16th century, Rabbi Azriel S. Solomon Daiena or Diena, of French origin (from Yena, ie Yenne, locations of Savoie), was known for his knowledge in matters of law and for exposing the maneuvers David Reuveni. In 1530, David Reuben went to Sabbioneta to meet a physician, Lazzaro of Guglielmo Portaleone (Eliezer), related to Pirro Gonzaga of Gazzuolo. He raised the suspicion of the Rabbi, who stepped forward to unmask his impostures. During the same period, before settling in Piedmont, the learned ritualist Yehoshua Boaz, son of Simone, son of Abraham Shem Tov De Benedetti, resided in Sabbioneta. He was the author of works on the Talmud and the rear legal texts. Azriel Diana’s successor was Rabbi Yohanan son of Yosef Treves, a French man of German origin as attested by the surname (Treves, in fact, is in French to name the German city of Trier). Treves was the author of a commentary on the Jewish festive prayers of Italian rite (Qimkhah deavishunah), a commentary on the laws relating to ritual slaughter by Mordechai Ben Hillel and other legal writings. He arrived in Sabbioneta in 1539, after serving as rabbis in several Italian cities. Presumably, the position of Rabbi in Sabbioneta was later taken by his son Yosef Refael, author of a poem published at the end of the 1553 edition of Maimonides’ Guide of the Perplexed, and editor of the Song of Songs, printed in 1558. Later Refael Yosef moved to Ferrara and remained involved with Hebrew printing throughout his life.